Ruark Golf Properties provides the highest level of customer service with excellent course conditioning in spectacular settings at our waterfront golf courses. Our professionally trained staff will go beyond expectation to achieve the finest golf experience for you and your guests. We are dedicated to the traditions of golf and invite you to play our exquisite Eastern Shore golf courses that were created in harmony with the land. A variety of Ocean City golf courses and golf packages are available to make sure your next Ocean City golf trip is the perfect golf vacation. 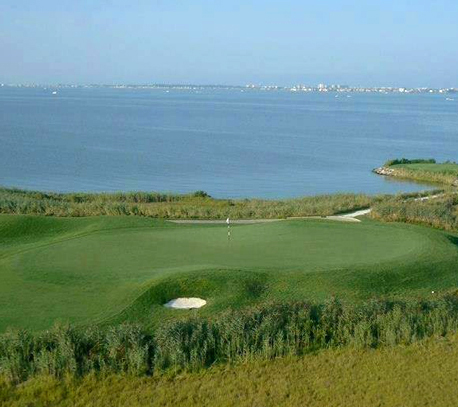 Rum Pointe Seaside Golf Links has become Ocean City’s “must play” new course and one of Maryland’s premier golf venues. Beautiful lush fairways roll over gently sloping hills, past eight water hazards and through a maze of over 50 bunkers, to rolling greens built to USGA specifications. The course features pure, windswept links golf. The golfer faces challenges often found in the British Isles including large greens, double fairways, pot bunkers, sand dunes, and the ever-present eastern shore winds. The site’s beautiful tidal marsh comes into play on five dramatic holes, offering amazing views. Rugged, breathtaking bunkers reminiscent of golf’s great past is the signature of the War Admiral Course.